Browse: Home / mdharvest – Metadata harvesting. 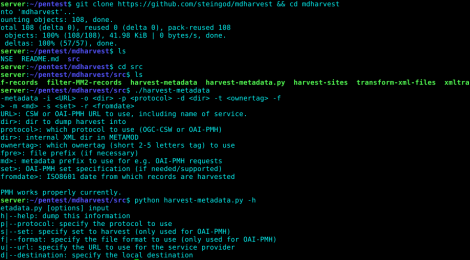 mdharvest is a Perl and Python code to harvest discovery metadata using OAI-PMH, OpenSearch and OGC CSW. Not all protocols are fully supported yet. Harvesting is coupled with filtering of records harvested according to GCMD Science keywords and latitude/longitude. The latter filtering is yet not configurable in top level functions. ← Chaos – BGP and Traffic Simulation for Evaluation of Internet Resiliency Systems.